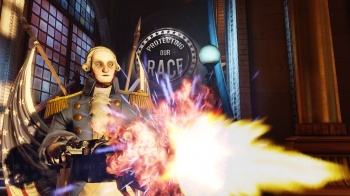 Bioshock Infinite is the first game from developer Irrational Games since the original BioShock title. And, as the television ads have firmly hammered into all of our skulls, that adventure remains the highest-rated first-person shooter of all time. So what more can its spiritual successor do than attempt to emulate an already winning formula? Well, a lot, as it turns out. Far from the watery walls of Rapture, Infinite takes place high in the clouds, in a floating cityscape called Columbia. Founded by a single man -Â Zachary Comstock - the city is a bustling setting unlike anything we've previously seen from the series. As Booker DeWitt, you take to the skyward state in search of a young woman named Elizabeth. Precious few details are offered upfront, but it's clear from the start that finding and rescuing the imprisoned damsel will allow you to skirt an unspecified debt. The story is at once original and enthralling, and the twists and turns that it throws at you are beyond mind-bending. Many games struggle to even piece together a coherent narrative, but Infinite weaves a tale so complex, yet gripping, that it may sour you on other titles for many days to come. It is, without a doubt, one of the most carefully crafted videogame narratives of all time, and you'll want to embark on an immediate replay as soon as the credits roll. Comstock fancies himself a prophet, and this mindset has rubbed off on the majority of Columbia's inhabitants as well. Your quest quickly puts you on the wrong side of both Comstock and the city's security forces, and before you know it you're blasting foes with both firearms and supernatural abilities called "vigors" - akin to the plasmids from the first two BioShock titles. As always, combining the vigors with well-timed physical attacks makes for a fantastic one-two punch, and besting a squad of bad guys by yourself is immensely satisfying. You'll have plenty of opportunities to try out both new guns and pseudo-superpowers throughout your journey, and while you may run low on offensive weapons from time to time, scavenging the battlefield will almost always turn up plenty of ammo and salt - the material required to use vigors. Like plasmids, the vigors vary in their usefulness and can be used either in a purely offensive manner or set up with defense in mind, buying you a few precious seconds when enemies close on your position. Also aiding you in your fight is the inclusion of wearable gear - four different slots in total - that can be used to complement your play style. This gear is usually found in out-of-the-way places, so exploration is encouraged. The addition of gear adds a welcome layer of depth to building Booker to your liking, and the experimentation it allows is extremely enjoyable. On your journey, you'll be led through Columbia's seedy underbelly which is rife with racism, cult mentality, and a population that idolizes government officials as religious figureheads. The racist leanings of certain groups in particular are bound to ruffle some feathers, but in a game that shows the pitfalls of following a certain ideology through to its bitter end, broaching the topic of racial inequality draws a fitting, if unsettling parallel to our own world history. You'll navigate Columbia either on foot or via elevated tracks that connect parts of the floating city to one another. Using a handheld contraption called a Skyhook, you can deftly maneuver the sweeping metal rails to cover vast amounts of ground very quickly, or even utilize them during combat by quickly changing positions or attacking your foes from above. This mechanic works absolutely fantastically, and particularly tough battles are made much easier if you're willing to put your Skyhook skills to the test.